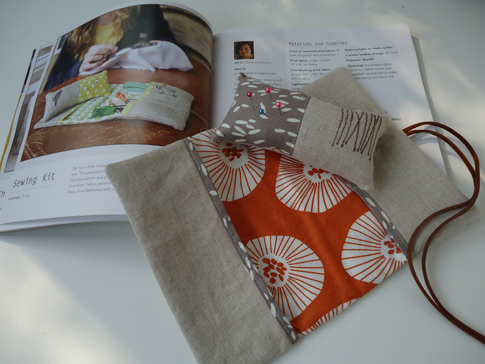 I'm so excited to once again have a sewing project and pattern featured in Stitch magazine. 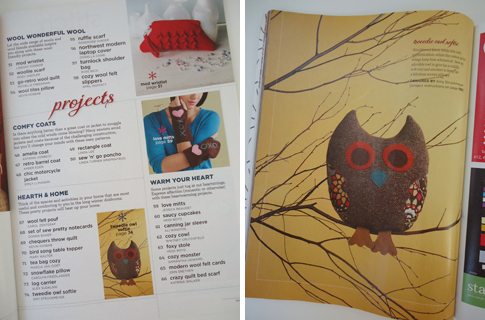 In this Winter 2012 issue of Stitch (a quarterly special publication of Interweave Press), I'm delighted to share with you a pattern for one of my wool and felt owl softies. The pattern is for the larger owl with the appliqued cotton print wings. 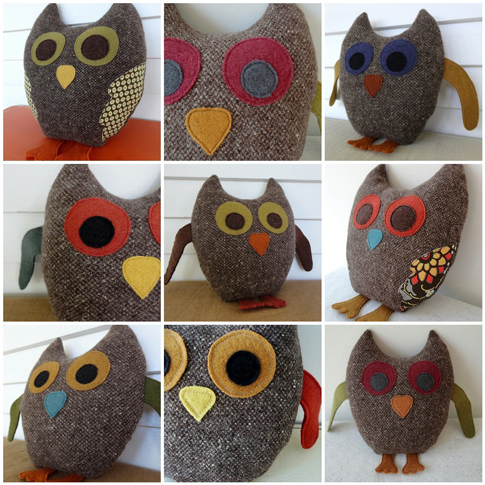 I've been making these owls for a couple of years now to sell in my Etsy shop and at craft fairs. You won't find them in the shop right at the moment (per my contract with the magazine), but now you can make one yourself! Mr. Owl is featured on the Table of Contents page, and here he is (on the right) in his full page spread! He (and I!) 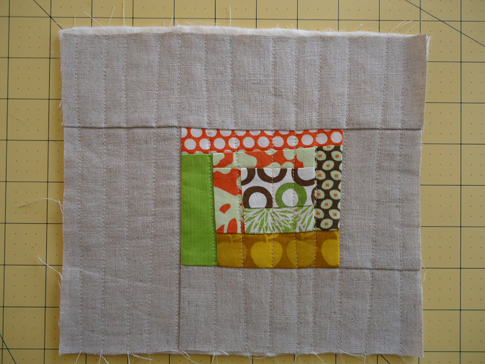 also got a lovely little write up on the Cloth Paper Scissors blog -- the post even shares the instructions for how to stitch up this little guy. So, although I recommend buying the magazine for all the other fabulous patterns and projects, you don't need to just to make an owl. When I made the first owl (my son and I designed one together for my daughter's second or third birthday -- I can't even remember which now! 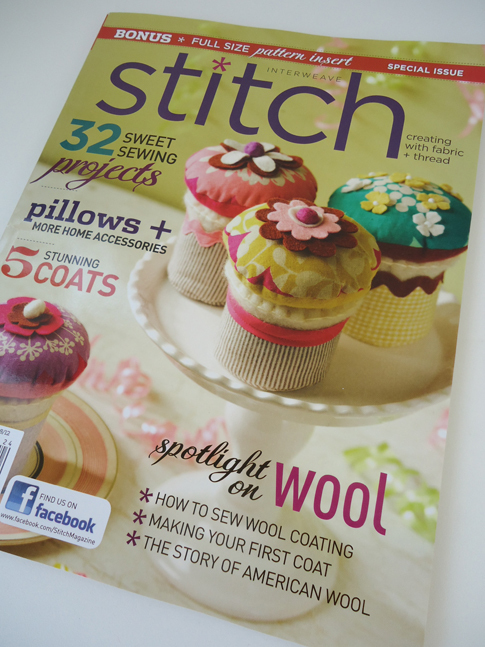 ), I never would have believed that he'd be published in a hip sewing magazine. Whoo knew?! Many of the students at my kids school have my screenprinted t-shirts, and I love seeing them on various kids at school events or on the playground after school. It's incredibly gratifying to realize that someone picked out a shirt with my design to wear... because they like it. But this really made my day! 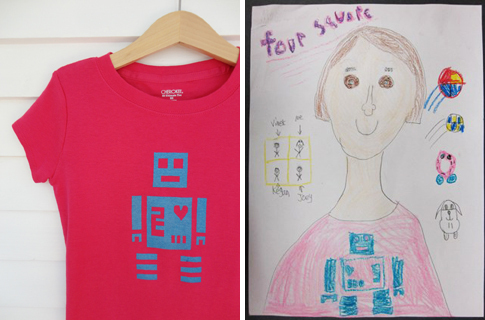 When my son's friend Maggie was given the assignment of drawing her self portrait in Art class, she drew herself in her robot shirt! And look at the detail with which she drew it. I just can't stop smiling. I... love... this! Thanks, Maggie. I'm also loving this book that I found by accident at my local library yesterday. 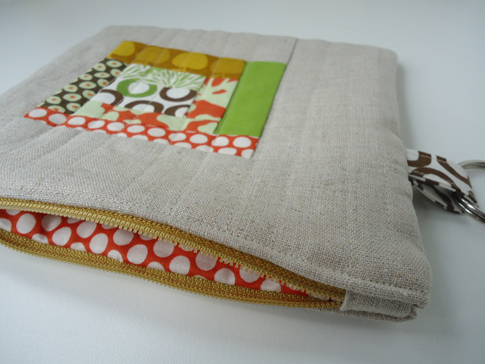 Love the freeform, beautifully hand stitched and upcycled projects. I seriously want to make them all. When I'm done drooling over the library copy, I think I'm gonna need to buy my own. My sincere apologies to those who check out the book after me! 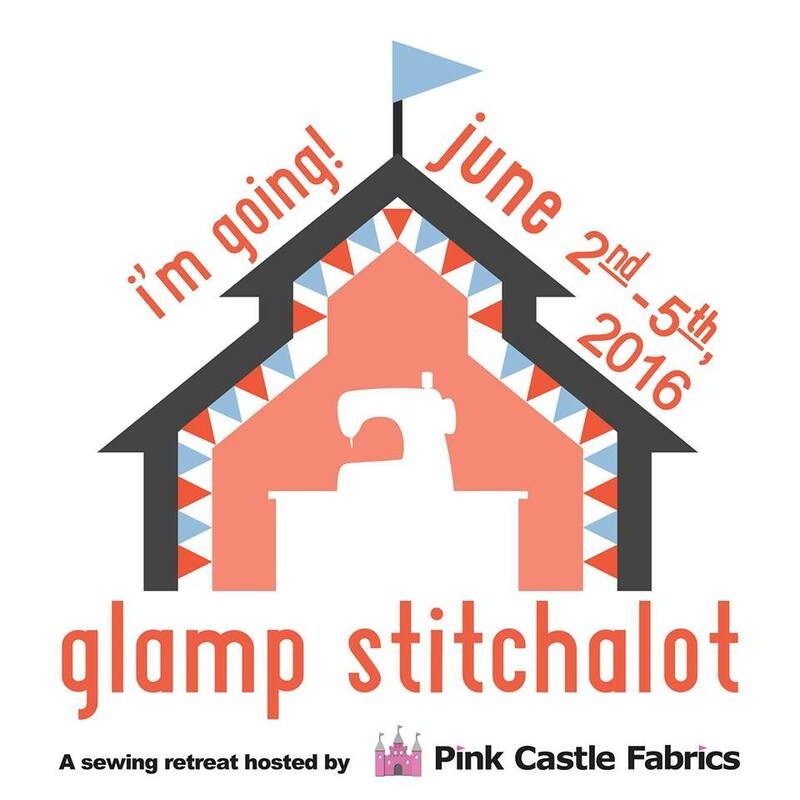 Oh, and I can't seem to stop sewing things for Sewing Summit. More finished projects to be posted soon! 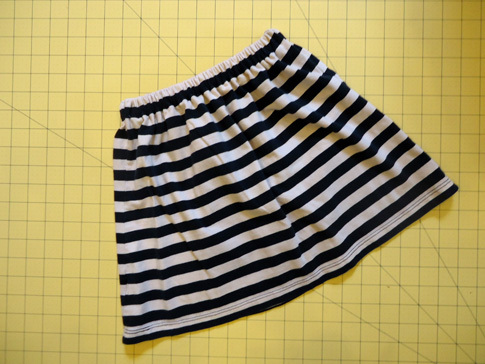 Up until about three months ago, one of the last things I thought I'd be posting is a tutorial for a girl's skirt. Before that, I really had no one to sew a skirt for... except myself, of course. Then, surprisingly, my previously anti-princess, anti-skirt, and anti-dress daughter decided she's okay with certain types of skirts and dresses. Still, no ruffles, bows, or anything too frilly -- and I'm just fine with that. It started when she said she might want a jean skirt like the one I was wearing. Then, when my mother-in-law took her shopping for a few new fall outfits, she not only picked out two dresses, but came home wearing one. I took this as an opportunity, and quickly stitched up a (not-too-girly) skirt from an old t-shirt of mine that I'd been saving. And she likes it! She's still anti-princess, though. Thank goodness, or I think all this change would be too much for me! 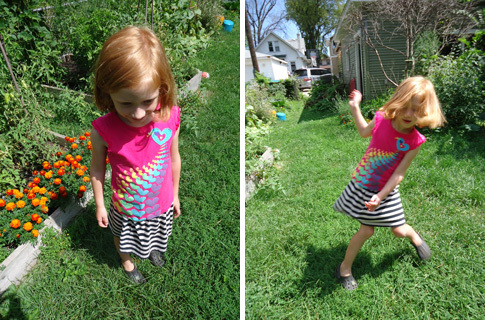 So, without further ado, here are the easy peasy instructions for sewing your own girl's skirt from a tee. 1. 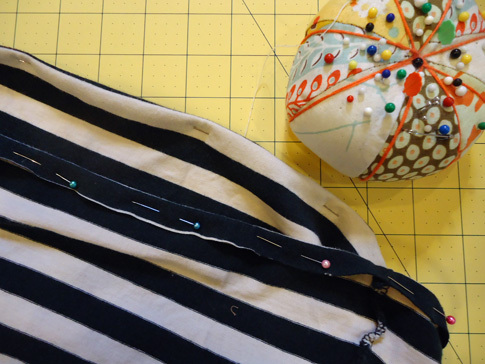 Decide on the length you want the skirt to be -- from waist to hem -- and add about 1-1/2". 2. 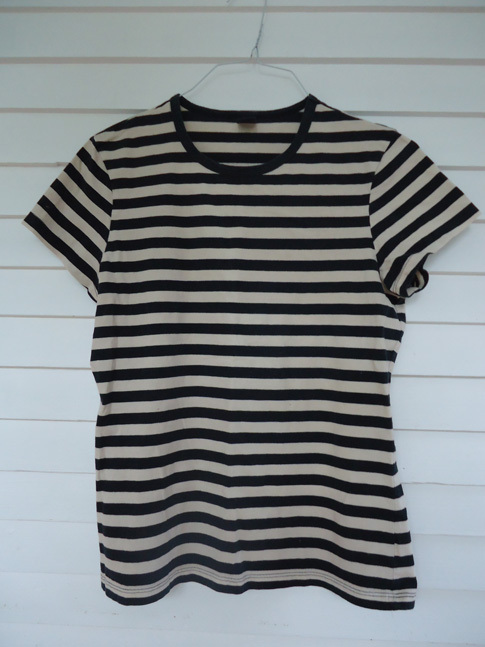 Lay your t-shirt out flat, straightening the side seams and aligning the bottom hem. 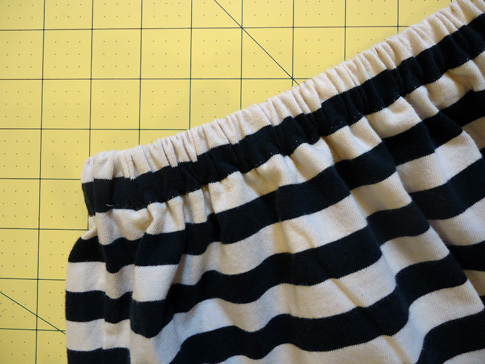 The bottom hem will be the hem of your skirt, and you'll keep the side seams intact, too. 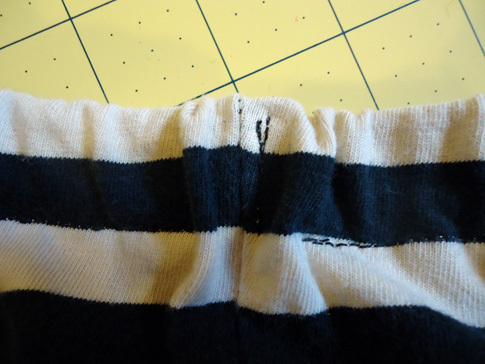 Mark the length from the bottom hem, and cut straight across. I used a quilting ruler, rotary cutter and a mat, but scissors would work fine, too. 3. You'll end up with a tube, like this. 4. 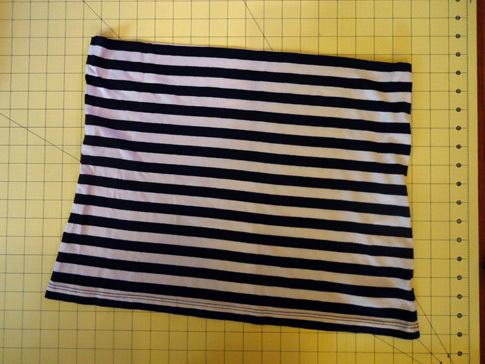 Turn the tube of fabric inside out, and, at the top (cut edge), fold 1/2" to the wrong side, and pin. 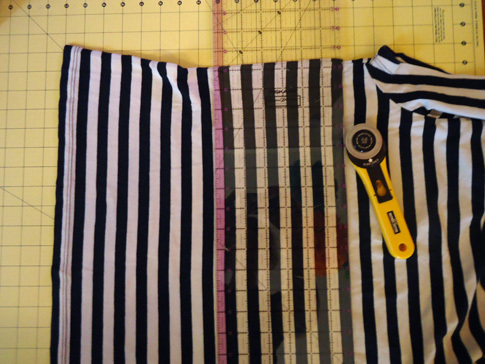 The stripes on my shirt just happened to be 1/2", so I just used them as a guide. 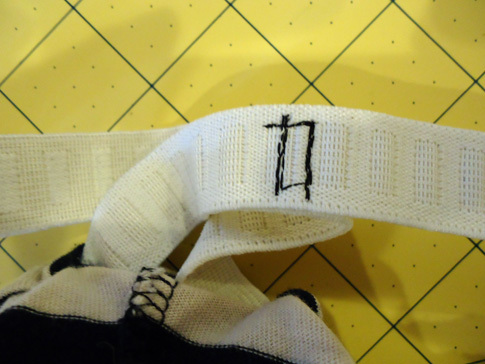 Stitch about 1/4" from the folded edge, stretching the knit fabric ever so slightly as you go. 5. Turn the same edge another 1" to the wrong side, and pin. 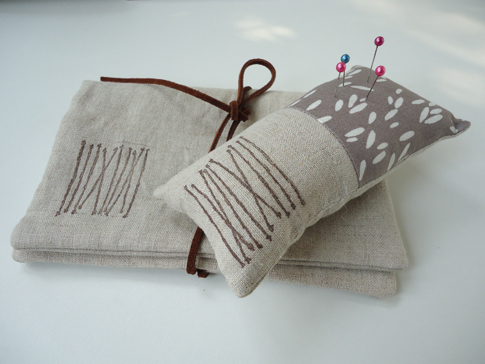 This time stitch just to the left of your first line of stitching (see photo above). Start near the center of the back of the skirt, stopping about 1-1/2" before the point where you started, in order to leave an opening for the elastic. 7. Sew the opening in the casing closed, being careful not to catch the elastic in the stitching. Then distribute the fabric evenly around the waistband. 8. 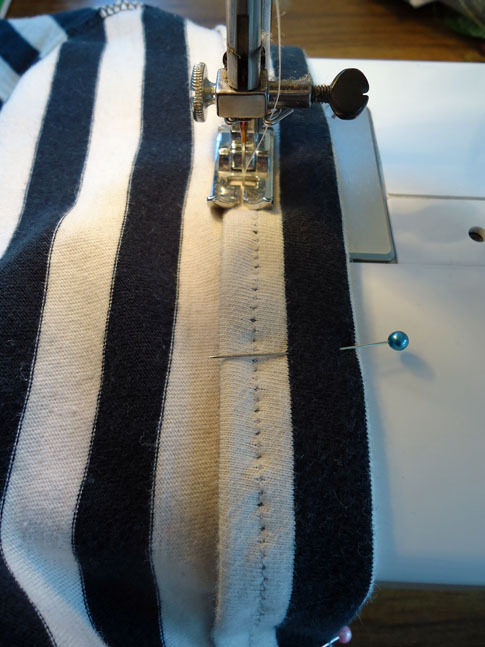 If desired, stitch the elastic in place along each side seam to secure. 9. And that's it! You've upcycled an old t-shirt into a fun new skirt! I was happy to have such an eager model for my skirt! Doesn't she look like she's having fun? 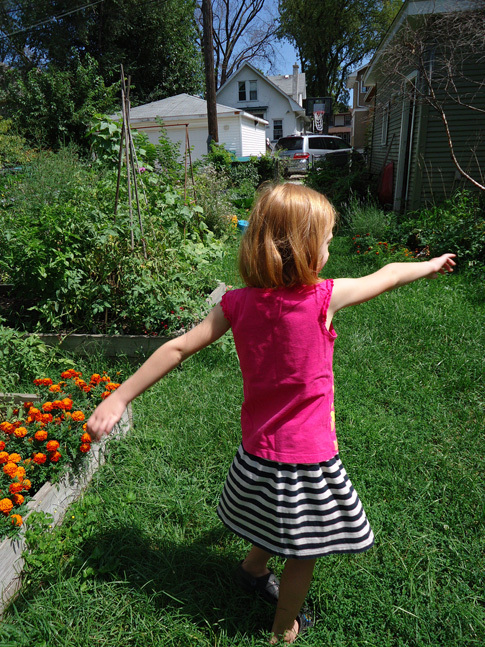 If you decide to make a skirt from this tutorial, I'd love to hear about it -- and even see photos! It's such a simple thing. It's also a respite, a comfort, and something I look forward to each day... I even think about it some evenings before drifting off to sleep. I'm guessing I'm not the only person who feels this way about their morning cup of coffee... or tea... or, in my case, a homemade latte. And what makes it even better for me is to drink it from just the right mug. I like one that's a bit on the large size -- big enough to comfortably wrap both hands around. Yes, I love this mug. It makes me happy. (And I bought it for only about $3 at my local Target!) 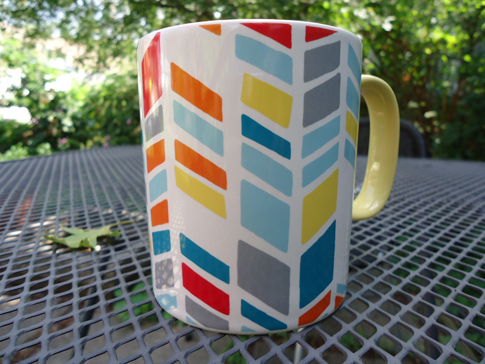 The cheerful colors... the slightly wonky design... it's perfect for my morning coffee. 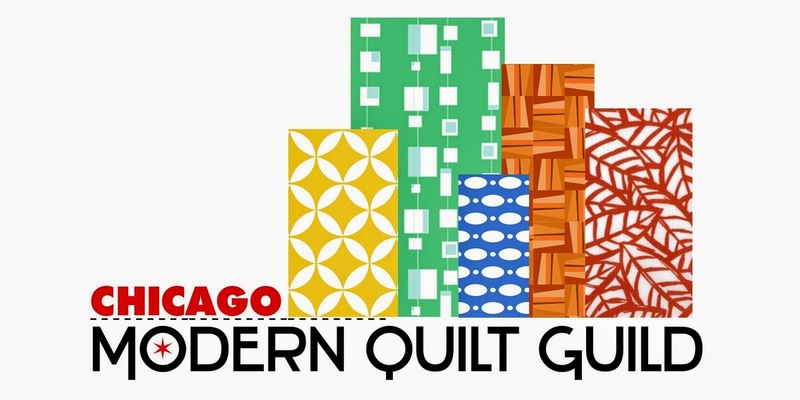 Perhaps my first quilt will be an ode to this mug -- it would be lovely to work with these colors. What ordinary object do you love?